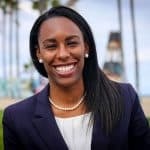 Kayla Griffin became the owner of a Chick-fil-A franchise at just 26 years old and it all started when she had just stopped running track at the University of Florida. She was in Los Angeles working on an internship program with the Los Angeles Unified School District Athletic Department. Kayla needed some extra money and decided to apply to work at Chick-fil-A. She started at the bottom, cooking and cleaning bathrooms. Little did she know her hard work and commitment to excellence in everything would start the path down a career that would see her as a manager of the franchise which was making a move into LA. She was soon traveling around the country leading the opening of new stores preparing for her ultimate goal. She wanted to own her own franchise and after three years of interviewing, being turned down, waiting, and taking a demotion in position, she became the owner of a new Chick-fil-A franchise in the heart of Marina Del Rey, a highly sought after location. Listen as she tells her story.